At the end of February, EADA students completed the first edition of the Imagine Internet of Things (IoT). Imagine IoT is an initiative launched by the Imagine Creativity Centre in Silicon Valley, whose mission it is to change the world through disruptive ideas and multidisciplinary teams. In the IoT programme, companies presented a unique social challenge to four teams. EADA students worked as business developers in all four of the proposed projects. The programme took place over 4 months and included mentoring by entrepreneurship experts, workshops, and masterclasses. Autopistas (an Abertis Group company) presented the team with the challenge of developing an IT solution that would enable them to maximise road safety for people on motorways. The team suggested an innovative solution called SafeBeat, a device designed for drivers stranded on the hard shoulder. At the press of a button, it sends the location to the Motorways Control Centre, gives precise voice instructions to maximise safety, and warns other drivers on the motorway to slow down. Biotech start-up Adan Medical Innovation is committed to improving the lives of people faced with anaphylaxis, a severe allergic reaction that affects the entire body. Adan Medical Innovation challenged the second team to save lives by devising solutions for a person suffering from anaphylactic shock in a public place. 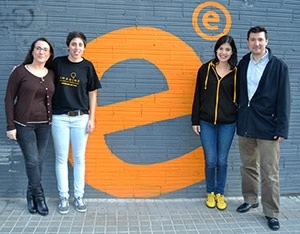 MBA Part Time alumna Carmen Delgado took part in this project. “We have developed an adrenaline solution that any person can use in an emergency,” she explains. For Carmen, the prototyping phase of the project was critical, as it was the moment when the expertise of each team member came into play. After taking part in Imagine IoT, Sindy has made up her mind. She wants to devote herself to the Internet of Things. Mattress manufacturer and distributer Dormity.com challenged its team to design a smart mattress that could gather information on people while they are sleeping in order to help improve sleep quality and, ultimately, quality of life. For Eduardo, the project symbolises the change in business models that is being ushered in by the IoT. “This change provides companies with more information about customers and contexts, which will lead to higher levels of customer loyalty,” Eduardo predicts.